Transfer Deadline Day saw popular Motherwell midfielder Gael Bigirimana depart the club after 57 appearances and join Premiership rivals Hibernian until the end of the season, writes Craig Goldthorp. 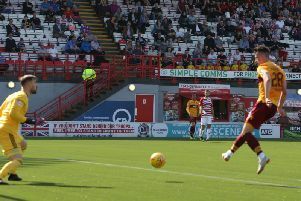 The Motherwell Times interviewed Bigi – who scored three goals for ’Well – on several occasions after he joined in summer 2017 and we always found him articulate and thoughtful. Although his career with the Steelmen was mixed – my most vivid memory is of him hitting the bar with a free-kick in last summer’s William Hill Scottish Cup final – there were some definite highs along the way. After admitting that he originally thought Scottish football would be “easy” in his first season before discovering just how competitive and cut throat it was, Bigi returned for the 2018-2019 campaign with the bit between his teeth and looking really up for the challenge. August 2018 was his best month in a claret and amber shirt, as he produced man of the match displays in a 1-0 Betfred Cup win at Livingston and a thrilling 3-3 league draw with Rangers. The following week, he then scored what turned out to be his last goal for the club in a 3-1 league win at Dundee. At that point, the Scottish Premiership looked to be Bigi’s oyster as he would literally have been one of the first names on manager Stephen Robinson’s teamsheet. Although Bigi then starred in crucial autumn league wins over St Mirren, Dundee and Aberdeen, he soon found himself relegated to the role of substitute and suffered a nightmare moment after coming on as a substitute in a home league game with St Mirren on December 22. It was Bigi’s slip which let in struggling Saints to net the only goal in a 1-0 win. And, in truth, his Motherwell career never really recovered from that. The 25-year-old former Newcastle player made his final Steelmen appearance as a 71st minute substitute in Saturday’s 1-0 success at Dundee. Thursday night’s move to Hibs appears a good one for all parties. Motherwell have gained compensation for a player whose contract was due to expire in the summer, while having talented midfield kid David Turnbull signed up on a new two-and-a-half- year deal. And Bigi will also be happy at joining one of the biggest clubs in Scotland, in terms of fanbase rather than current form on the park at least! The midfielders left at Motherwell – Turnbull, Allan Campbell, Jake Hastie, Gboly Ariyibi, Alex Gorrin and Elliott Frear – give grounds for optimism that Bigirimana’s departure won’t hurt the team too much. “I’ve loved my time at Motherwell,” Bigi said on his departure. “It’s been a memorable 18 months for me and my family. Manager Robinson added: “We would like to thank Gael for all he has done at the club. * Motherwell have loaned out Aaron Taylor-Sinclair, Broque Watson and George Newell, to Crewe, East Fife and Albion Rovers respectively, until the end of the season.